Beijing is a great place to live. But before you take the plunge of moving to China, you’ll need to consider the cost of living in Beijing. Can you afford to move? Will you be able to rent a decent apartment? How much will you be able to socialise? Find out how much it costs to live in Beijing! We had expectations about the cost of living in Beijing but the countless internet searches I did returned with conflicting information. Some sites claimed that we’d be living like kings for the year and we’d be saving £20,000. Others played it all down and told us to not accept a salary less than 15,000RMB (£1783) per month else we wouldn’t be able to afford rent. Both have valid arguments so I thought I’d settle it properly here! There are plenty of pros and cons of living in Beijing in 2019, but the cost of living here is definitely one of the best things about it! As teachers in Beijing, we made good money but what’s the point in having a lot of money if you just have to spend it all to be able to survive?! Luckily, Beijing is a cheap city to live in, in comparison to our home in the UK so we were able to enjoy our salaries. READ MORE: 10 Things To Know Before Moving To China! *Currently the exchange rate is 1RMB = £0.11 or $0.16. The living cost in Beijing in comparison to home will obviously vary slightly depending on the exchange! READ MORE: Moving To Beijing? Check Out These 4 Things You’ll Definitely Need! What Do Things Cost In Beijing? Your Bills in Beijing Will Be Cheap! The Cost of Shopping in Beijing Depends on Your Habits! What Does Living in Beijing Cost? Is it easy to move to Beijing? Should you tip in China? Is Beijing an expensive Chinese city? How much money should I bring to Beijing when I start a job? Is it safe to live in Beijing in 2019? Before you read into how much it costs to live in Beijing in a month, check out these quick typical price guides to everyday things you might buy. These prices are an average so they’ll just give you an idea of the money you’ll spend regardless of how long you stay in the city. When thinking about your living cost in Beijing, you’ll need to plan for rent . Beijing is the capital city so you’re probably going to end up spending more on rent here than anywhere else in the country (the cost of living in Beijing vs Shanghai is probably lower actually). Saying that we found a two-bedroomed apartment on the outskirts of Beijing for 4000RMB per month. £448 was an amazing deal for our place! READ MORE: Take A Look Round Our First Chinese Apartment! You’ve got to think carefully about where to live in Beijing. We lived in Beijing but we weren’t right in the city centre. We weren’t out in the sticks either, so we have the best of both worlds. The public transport in Beijing is great too so wherever you live you’ll be able to get around! The average rent in Beijing for a whole apartment ranges from around 3,00RMB to 10,000RMB, unless you are really wanting something super fancy. You can find somewhere to live for 20,000RMB per month – if that’s the case, I want your job! As there were two of us, it was a much better deal but even if you’re living on your own you could afford that on a teacher’s salary. We also knew a couple living right in the centre and they were paying 8000RMB (£897 for a one bedroom, which is still miles cheaper than the London equivalent. Some of our foreign friends shared an apartment and so only paid for a room. They were further into the centre but were paying around 2000RMB just for a room. There are pros and cons of each. If you’re going solo then it might be better to share so that you don’t become a hermit in a new country. Thinking about where to live in Beijing and whether to choose a whole flat or a shared hutong building can be daunting. Beijing rent prices depend massively on location too so once you actually get there and can view a couple of places, it’ll all become a lot easier! When you first move to China, you’ll need to bring a good sum of cash to get you through until your first pay day. That’s to cover your rent deposit, your first 3 month’s rent AND the agency fee equal to one month’s rent. 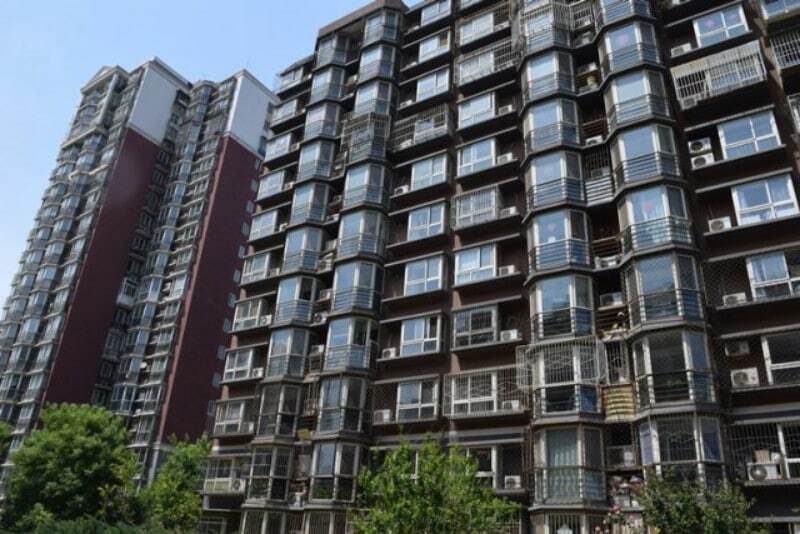 Read more about the renting an apartment in China here. Our bills were laughable. In our first year, for electricity we went to State Grid and put money on a card, which updated our meter automatically. It normally cost us 100RMB/£11.22/$15.57 per month. When we moved into a different apartment, we were actually able to pay our bills via WeChat – another great use for the app! 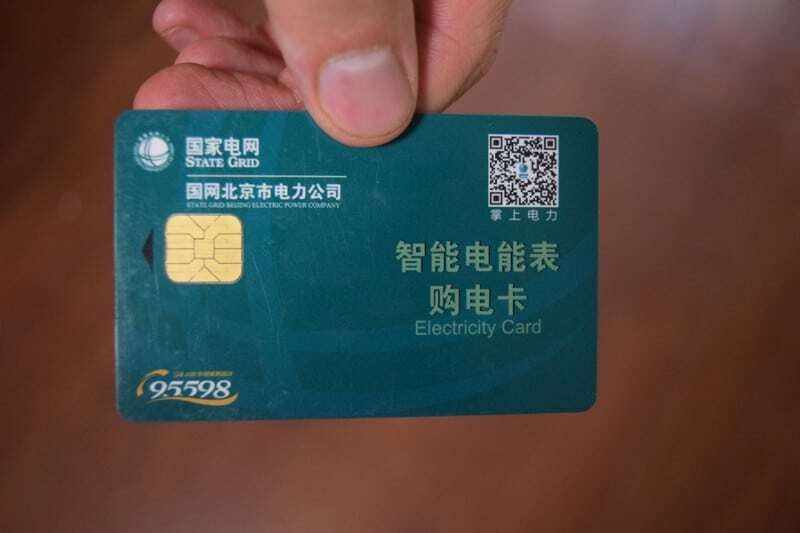 We also received a 7-month gas bill that we were scared to open – but it was only 70RMB! The landlord pays for the Chinese equivalent of council tax, plus heating (which is switched on at the same time every year in November, and switched off in March). The phone company used was China Mobile. You top up your phone with the amount of money your contract requires (ours is 80RMB) It then takes the money from the top-up on your phone on a set day every month. If you go over your monthly allowance, you’re cut off from everything! You can’t receive calls or messages, which is disastrous in my opinion, but it makes sure I put money on my phone every month! We had 30Mb broadband which is plenty, especially for 700RMB/£79/$109 per year. I’m not sure which company we were with as a Chinese friend sorted it for us but prices don’t vary that much. This isn’t really a necessary living cost but unless you can understand Mandarin AND enjoy Chinese war-time dramas, you’ll want to subscribe to Netflix or something similar. We did use this in England but it’s become a much bigger part of our lives since moving to China! We paid 65RMB/£7.30/$10.12 a month so that we could keep binging our favourites tv shows. ….Which leads us on to the next important purchase – a VPN! I can’t imagine any foreigner living in China without one. We decided to go with Astrill and it cost us about 1234RMB/£138/$192 for the year. Try out a few VPNs before you commit. We recommend Astrill because we used it for 2 years and we found it good value for money, and Express VPN offers a 30-day money back guarantee. Food prices in Beijing can be cheap, depending on your tastes! We did a weekly shop just like we would back home and made lots of meals from scratch. We ate out once or twice a week too. Normally we spent between 300 and 400RMB per week which is actually near on similar to English prices. I think in supermarkets in England there is a lot of competitiveness which drives the prices down massively, and of course, you have the value brands as well. The higher end of the price bracket for our shopping is usually when we need to restock on cleaning products or chuck in a bottle of wine! READ MORE: Discover The Real Food Of Beijing! If you’re only buying western food all the time, you can forget about saving money. The odd treat here and there won’t set you back a great deal but you’ll probably be drawn to western food more than ever before! 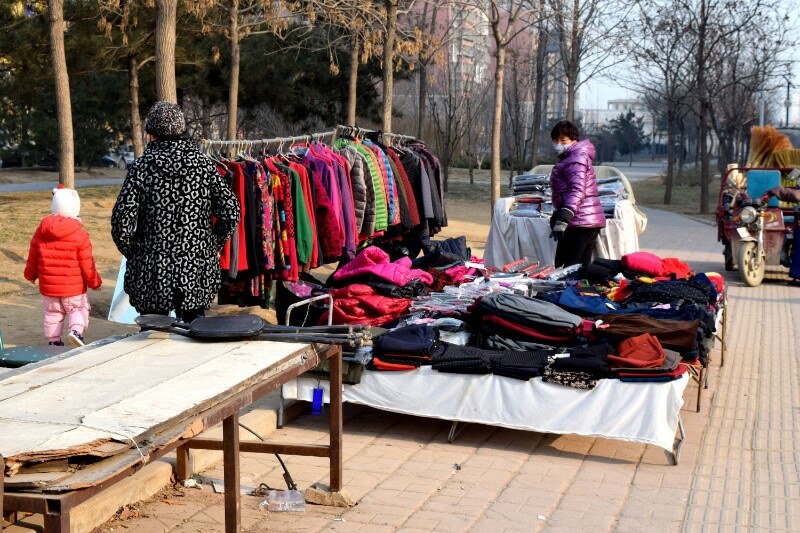 We usually spend around 300 – 400RMB a month on top of our weekly shop on western bits and bobs. April Gourmet and Jenny Lou’s are the go-to places to find cheese, frozen ready meals and and alcohol. Carrefour also has a decent selection and their stores are huge. our midnight snack was amazing! If you’re eating in a Chinese restaurant, you can expect low prices. Two huge bowls of noodle soup set us back 36RMB/£4/$5 last week in a small restaurant. If you’re looking for something more upmarket, then you’ll probably be looking at around 100RMB/£11/$15 for two people – you do get a lot of food though as everyone shares the various dishes in a Chinese restaurant, so you’re getting your money’s worth! If you eat out at non-Chinese restaurants, then you’ll find that you can pay upwards of 80RMB for a meal for one person. You can easily find Mexican, Thai, Indian, French and British cuisine to name a few. This is the one area where the prices in Beijing can get quite high. If we stay local and grab some Chinese beer from a shop to share with a group of friends, then you can spend around 30RMB for a crate, but in a bar, you’d spend that on one pint. There are often happy hours and deals if you look around, so if you’re looking to live within a budget but still have fun then get planning beforehand! 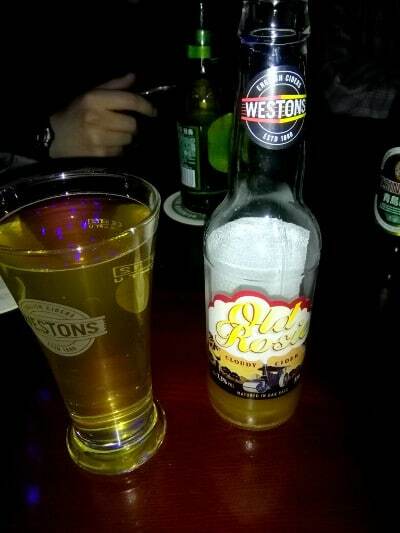 we found cider in Beijing! 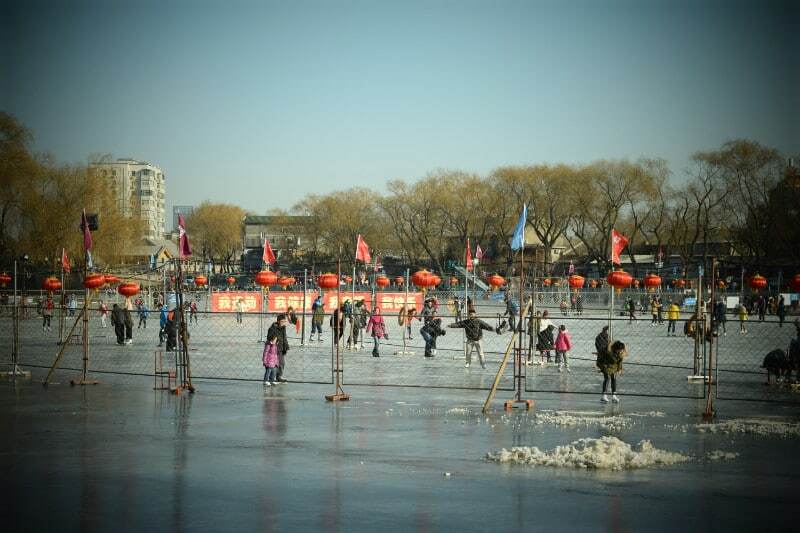 There are lots of fun things to do in Beijing, mostly without spending a lot of money too. We enjoyed checking out the touristy attractions Beijing has to offer, and many of these like exploring the Forbidden City or the walking streets, we paid a tiny amount in entrance fees or nothing at all. Bigger excursions like visiting the Great Wall or taking the sleeper train from Beijing to Xi’an obviously cost money but they should be affordable whilst living in Beijing. We’re not really huge shoppers but have mooched around a couple of shops to see if it’s worth trying to communicate in Chinglish! In short – the western shops like H&M and Hollister cost very similar to back home. A few of the make-up shops like Benefit and Mac are more expensive, but that’s to be expected really. If you’re feeling brave you could buy clothes from a local market and test your haggling skills but we haven’t bothered to do this as we’re not confident with the quality of the clothes we’d be purchasing! Transport is my favourite thing to mention when talking about the cost of living in Beijing. The day we arrived, we bought a subway card for 80 RMB. This doesn’t actually save you any money as opposed to buying a ticket each time you use it, but it’s just much easier and faster. 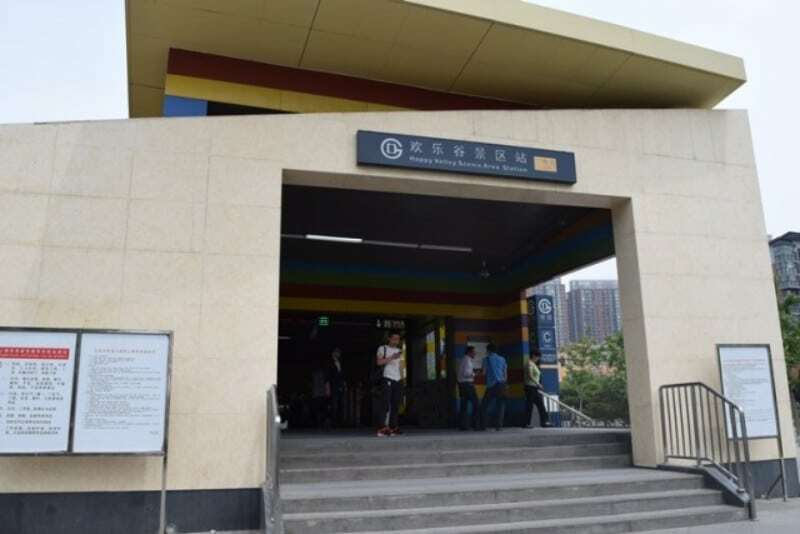 A subway journey across the city is usually a standard 3RMB. 35p!! It’s glorious knowing that however far you have to go, you won’t be breaking the bank to sit on these spacious, clean and very regular trains. Even better than the train prices – taxis! We can easily take a taxi from where we live to Sanlitun, which is roughly about a 25-minute drive without traffic. The driver will put on the meter (if they don’t then get out immediately!) and it’ll cost around 35RMB. That’s less than the standard pickup fare back home! You can download Didi which is a Chinese version of Uber – except you can book the city taxis through it which are the same price. The app just makes hailing a cab quicker and easier! Sanlitun is the rich, “western” area of the city. The roads leading there do get very busy, especially on the weekend. This can drive the price up as the meter ticks over even if we’re sat in traffic, but we have never paid more than 80RMB for the trip, which is still a good deal. our local subway station was also never busy! Tuk-tuks are also a very useful way of getting around the local area. They’re pretty speedy little things, and will generally take you anywhere nearby for less than 10RMB. They’re handy when you’ve got lots of shopping or just can’t be bothered to walk any further! When we first arrived in Beijing, we were really scared of getting into one. Mainly because they looked, and probably are, very dangerous as they weaved in and out of the cars. To be honest, we’re just used to them now and put just our trust in the driver! We haven’t used buses that often, because the stops are in Chinese characters! Our Mandarin definitely does not stretch that far. The only time we’ve used them has been when we have been with Chinese speaking friends. Once we learn a route we could probably use them more though. It’s 1RMB per journey – yes, 1RMB! Even cheaper than the subway, but you still have the traffic to sit through and you” likely have to stand. We also bought bicycles to get to work every day. There are lots of markets that sell bikes for really low prices. We paid 250RMB each for our bikes which were in amazing condition, with a basket, bell and lock. As a couple, we managed to live on quite a small budget in Beijing. We ate out regularly, we’d enjoy wine or beer at the weekends and we also bought a fair amount of tech for our travels. These included a GoPro, two DSLR cameras and two laptops (check out Jade’s which we think is perfect for using whilts travelling) during our time in China. We also adopted two cats + flew them home to England which cost us a lot. Our average living cost in Beijing was 8766RMB per month, which is about £983/$1364. Between two people, that’s a pretty decent amount of money to be living on. That equals out to be an average of £491/$682 per person, including ALL bills! It allowed us to send home the majority of our pay which is amazing. Living expenses in Beijing in 2019 can be very low, as long as you don’t go crazy! 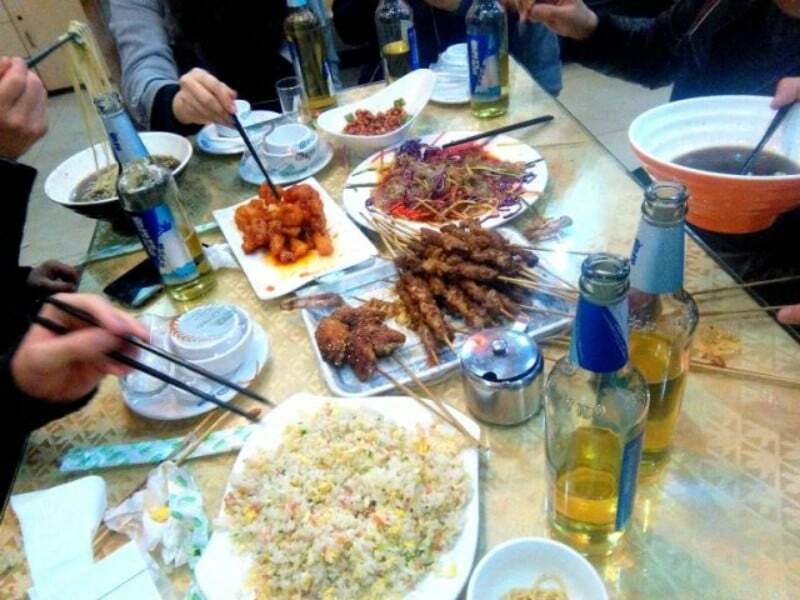 Living in Beijing in 2019 can be expensive if you’re going out to wild parties and hiring a personal driver. But if you’re relatively careful then you can start to save a big old pile of cash. Not bad for a teacher, eh! If you have a job lined up and can secure a working visa, then yes. However, long-term it is incredibly difficult to move to China in general, especially if you are not even living in the country yet. No. It can be considered quite rude if you offer money to someone who has served you, as they might feel like you are implying that they don’t already make enough money. Saying that, don’t be too worried about offending people. If you are in a tuk-tuk, for example, the ride has cost you 9RMB but you only have a 10 and the driver doesn’t have change – that’s different! In comparison to other places in China, yes, Beijing can seem expensive. Shanghai probably costs more to live in, as there are a lot more foreigners there, and places like Guilin in the south are even more budget friendly. However, Beijing is still a cheap place to visit! The upfront costs of living in Beijing can be quite high because of the way the rent system is paid for, as well as the time it can take to be paid for your first month of work. You’ll usually need to pay 3 months rent first, as well as a month’s deposit and a month’s agency fee (remember that although it seems a lot, it means that you won’t pay rent from your first 3 pay cheques, and you should get your deposit back at the end of your tenancy agreement). You also may have to work 6 weeks in advance of your pay because most Chinese companies pay in the middle of the month but their payroll systems begin from the 1st. For example, we began our job on the 1st of September and we weren’t paid until the 10th October. Beijing seemed pretty safe to us and I can’t recall a time when I felt uncomfortable to the point of thinking something bad was actually going to happen. Of course, I always had my wits about me, just like I would in any city. Don’t walk around busy tourist attractions flashing your expensive phone to everyone, don’t get in unmarked taxis and be careful when you’re out drinking that you don’t leave your glass unattended. These are all pretty common rules to live by wherever you are though! Do you live in Beijing? Do we spend too much or should we splash out a little bit more? 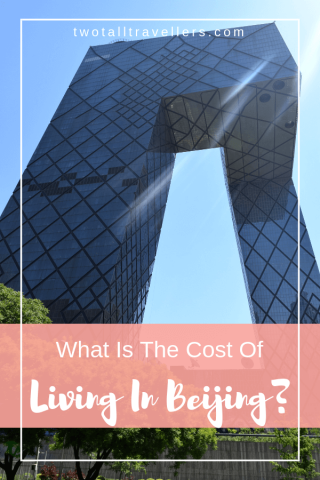 Let us know if you have any questions about how much it costs to live in Beijing! Click on the image below to repin this post! If you are from the West then everything is gonna seem cheaper in Asia. Also China keeps changing its currency value according to the Market. Not sure if that affects the tourists. Exactly! Was a good shock moving from London to China. Prices stay low for tourists but are even lower for locals/expats who know where to look! This is such a great resource for anyone moving to Beijing. Knowing what kind of prices to expect so you can set a budget beforehand will relieve a lot of financial stress as I’m sure moving to a new country is already stressful enough! Thanks for adding in details like how to get a phone set up – essential! Thanks! Yeah we saw so many different guides with completely different and outdated information so we wanted to put it straight! I’ve never really thought about living in Beijing. I hear the wifi is horrible. How do you pay for that? And living there, do you have problems with it? The wifi is great actually, it’s just that you need a VPN to access so many websites! This year our wifi is included in our rent which is good but last year we paid for a year upfront so it was easy! This is a really good budget! I was under impression that China is already more expensive for living. Beijing is definitely more expensive than most other cities, except Shanghai, but it’s also so much cheaper than any Western country we have been to! China seems very friendly on the pocket. So, I’m guessing vacation budgets would be much lower than in Europe. Yes I would say so, only if you’re smart about planning your trip though! Hotels and tour companies assume everyone coming to China has loads of money so often hike up their prices! Great information. Never considered living in this part of the world, but quite interesting to get an idea about living costs. It’s true that living like a local always makes an expat life a lot more affordable! It was quite daunting moving here but now we are so used to it and have an easy life here! Oh amazing, if she needs any more help tell her to give us a shout! We are moving to Beijing in August for the next 4-5 years and I have soooooo many questions!!!!! Would you be willing to let me email you or you email me with some of my questions? I am so nervous!!! Beijing housing is much more expensive now!!! I have rented a 3 bedrooms apartment with a walking distance to GUOMAO CBD. Rent is about 13,500 RMB per month – very expensive! Yeah we didn’t live a walking district to one of the most expensive places in China haha. We were outside the 3rd ringroad in a one bed apartment. You have to decide if you want to be able to walk out your house and be amongst the inner city or have to get a 30 minute train ride. The difference in rental price is huge. I found this article immensely helpful! I am moving to Beijing in July and as you can imagine…it’s daunting! Looking forward to future posts. If you need any help or advice on what to do in Beijing to do with absolutely anything give us an email and we will try to help. Good Luck! Thank you! I’m considering a job in Beijing and this really helped put the salary they offered me in perspective. Good luck and let us know if you need any more information! We were there for 2 years and will be returning in February so have plenty to share! After arriving in Beijing one of the most important thing is to find a nice place to stay, however the overwhelming nature of the environment and the unfamiliar language can initially be super stressful. High rental prices aimed for unsuspecting foreigners (just like me) are hard to miss. These are the problems many expats face after arriving in Beijing or anywhere else in China. Best thing is to look on some housing platforms and contact different real estate agents. Always have a contract and never give any money to an agent or a landlord without receipt. Agreed! We used http://www.ziroom.com/ to find our apartments once we were in Beijing but it’s always helpful to have a look around on different sites to get an idea of what you really want and need!